REV: Coat of arms of the Order. DOMUVS DE JAMOLICE below. + MIL . TEMPL . ORDO . EQ . J. CH . DE . TEMPLI . SAL. 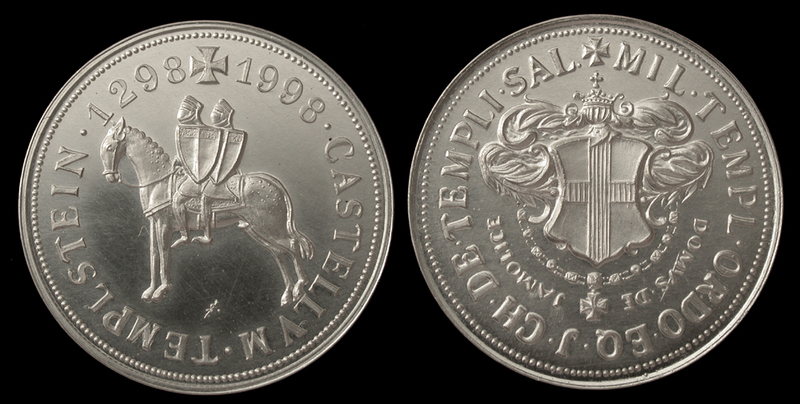 This beautiful medallion was struck to commemorate the 700-year anniversary of the founding of the Templar castle in Templstein, Jamolice (Moravia, Czech Republic). Now in ruins, it is one of the few castles in Moravia founded the by Order of the Knights Templar. A true collector's piece for Masons or anyone interested in the history of the Order of the Knights Templar.